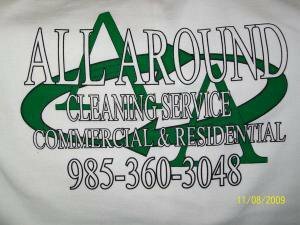 All Around Cleaning Service is locally owned and operated, giving South LA the best rates. We are a fully insured, licensed, and highly recommended company. Maybe you havent heard of us (yet). Let me introduce myself and my team. My name is Kelly Vanberge, owner and operator of All Around Cleaning Service. I was born and raised in Houma LA. I started out as a young adult helping my grandmother clean houses. During that time I started building relationships with her clients,their families,and associates,leading me to take on my own jobs. Right away i started building my own reputation as a hard worker. My clients compelled me to expand my services to meet their needs. Demand for quality work at reasonable prices quickly grew, motivating me to start my own business. With determination and hard work in October of 2009 All Around Cleaning Service was born. While launching this company, I have dedicated my life to making it a success. My team and I strive to make sure we meet all of your needs at reasonable rates & Your satisfaction is guaranteed ! My team members are all honest, dependable, and hard working. I wouldn't send anyone in your home that hasn't been in mine. All workers undergo back ground checks, drug screens, & one-on-one training with me personally.